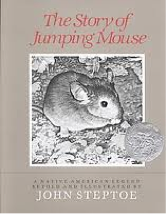 Briefly, this Native American story centers on a little mouse who journeys across the water, desert and mountains to finally make it to the faraway land he’s heard about in stories from elders. Along the way, he selflessly uses his gifts to help other animals he meets. Its a great message and a beautiful story. After we picture-walked, practiced the poses, and read the book, students were given pictures of each pose along with the name and asked to sequence the story based on those pictures. Then they were asked to retell or summarize each part of the story in their readers notebook. All in all the lesson went well, and the kids were into doing the poses, making the animals sounds, breathing exercises, etc. The sequencing was tricky for some, so we’ll need to go back and reflect on whether that was because sequencing in general is difficult for them or because we need to change something in the lesson to make it more clear. One hiccup we ran into along the way was realizing that it was going to take slightly longer than 45 minutes to get through the whole lesson, including the retell/summary portion. We had to stop before they could write the retell/summary, and Marcey had to revisit it later with the kids. The sheet with the pictures to be sequenced is on its way. Google docs was giving me some trouble with this. I used pictures of myself in the poses but the photos I took were too big. I will post pictures of others doing the poses pulled from Google images. If you have time, I recommend you take photos of yourself or one of the kids doing the poses and use those as it will make it more personal, consistent, and fun for the kids.